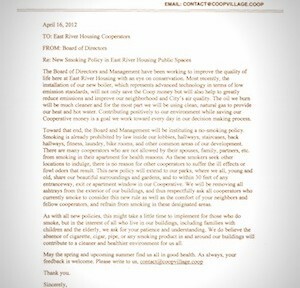 The Board of Directors has issued a new set of restrictions on smoking on Coop property. Following the lead of NYC Parks, which last year banned smoking in parks everywhere in the city, smoking is now not permitted in the courtyards between buildings nor within 30 feet of a door or window of the Coop. The hulking ashtrays by the front doors have all been removed (which will also undoubtedly send our canine cooperators into a state of urinary panic). Smoking is of course already forbidden by law in any indoor common areas — hallways, stairwells, laundry rooms, etc. So smokers’ only remaining refuge is the (semi-)privacy of their own apartments. Cooperatively Yours is an independent association of shareholder-tenants at East River Coop in Manhattan and is not affiliated with East River Housing Corporation. Get an email every time there's a new post to this website.